The state or act of being ridiculed or mocked with sarcasm or disrespect: There was a lot of derision and sneering going on when the teacher entered the classroom and found out that the new boy was the object of all of the laughter. 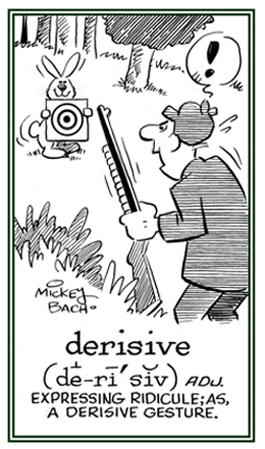 This cartoon provides an example of what the term derision is expressing. A reference to the action of mocking or ridiculing someone or something: The losing high school football players received a great deal of derisive comments, jeering, and rude remarks, from their fellow students. © ALL rights are reserved. 1. Relating to that which may be drawn, or received, as from some source. 2. 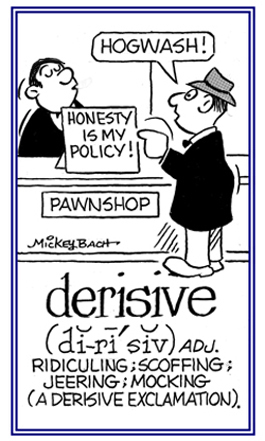 A reference to anything that can be received from ancestors: A derivable estate often comes from a relative. 1. The origin, or source, of something; such as, a word or someone's name. 2. The formation of a term, from another one or from a basic form. 4. A mathematical, or logical argument, whose steps show that the conclusion follows necessarily from initial assumptions. 5. The act of obtaining something from a source or issuing from a source. 6. Etymology: from Latin derivare, "to lead or to draw off (a stream of water) from its source". Then from Old French deriver. "to flow, to pour out; to originate". 1. An idea, language, term, or other thing that has developed from something else that is similar to it. 2. A word that is formed from another word; for example, "quickly" from "quick" or "electricity" from "electric". 3. A chemical substance that is formed from a related substance; such as, an opium derivative. 4. A financial product that can be traded and whose value depends on the value of some other asset or combination of assets. A contract, or security, that derives its value from that of another form ov security or from the value of a rate; such as, interest or a currency exchange, or the index of a stock index. Derivatives often take the form of customized contracts transacted outside of security exchanges, while other contracts; such as, standard index options and futures, are openly traded on such exchanges. 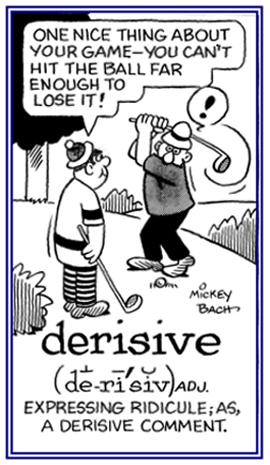 A derivative is also defined as a contract to buy or to sell an asset or to exchange cash, based on a specified condition, event, occurrence, or another contract. 5. Etymology: from French derivatif (15th century), from Latin derivativus, from the past participle stem of derivare, "to lead or to draw off (a stream of water) from its source"; from de, "from" + rivus. "stream". 1. To obtain, or to receive, or to come from a source. 2. To arrive at by reasoning; to deduce or to infer: Mildred always strives to derive a conclusion from facts rather than from guessing. 3. To trace the origin, or development, of a word. 4. To develop from another word or a source word or term. 5. To create a chemical substance from another substance. 6. 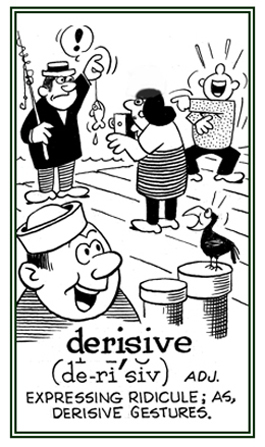 Etymology: from Old French deriver; from Latin derivare, "to lead" or "to draw off (a stream of water) from its source"; from the phrase de rivo, from de, "from" + rivus, "stream". 1. Someone who draws something from a source. 2. Anyone who receives, or obtains something; especially, from a specified person or place. 1. To take away; to belittle or seek to lower by suggesting that something or someone is not important or worthy of respect: To derogate a person’s authority is to undermine it, and to derogate someone’s rights is to restrict them. The queen felt that summoning a parliament would derogate her royal authority. The book derogated the achievements of the former president of the company. Jim, the coach, derogated just about everything the new player, Dudley, did on the football field. 2. To stray from a standard or expectation; to deviate: Jason committed an intellectual error that will derogate his reputation as a scholar. 1. A partial repeal, or abolition, of a law: The state government passed a derogation of some social services because it was costing too much to maintain them. 2. A deviation from a rule or law; especially, one which is specifically provided for: The Senate Committee required new data in order to determine which sectors of the law would qualify for the derogation. 3. The act of belittling, or criticizing, someone or something: Gary, the radio talk-show host, used derogations to discredit the politician's positions on how to improve the nation's economic situation. Tending to be detractive or disparaging: The way some politicians are making so many derogative remarks about their fellow political party candidates causes some people to think negatively about all of those who are running for that party's office. Pertaining to speaking about someone in a disrespectful way: Ralph was a good manager in that at least he never derogatively criticized an employee in front of the other workers. Showing page 37 out of 44 pages of 646 main-word entries or main-word-entry groups.